E-cigarettes - the government says they can help people to stop smoking. So why are they banning their sale to people under the age of 18? 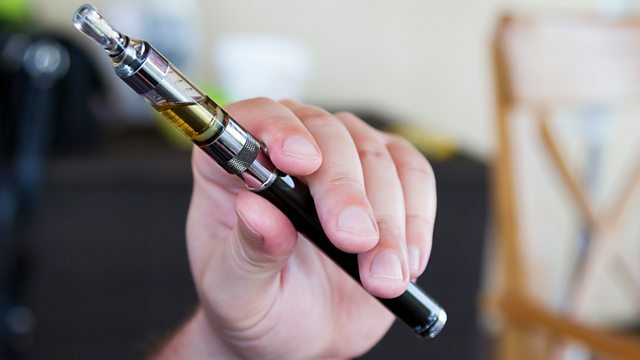 The government has acknowledged that electronic cigarettes can help people to give up smoking. So why has it changed the law in England to ban sales of e-cigarettes to under 18s? A mother tells us that she believes they could be the best way to help her teenage son to give up smoking. Tesco has changed its price-matching scheme which compares the prices of goods at their biggest rivals, and gives shoppers back the difference. The vouchers, given out when you pay, have been scrapped. Instead the difference will be deducted immediately at the checkout. But it will only apply to branded goods and the system won't compare prices at the discounters Aldi and Lidl. We investigate why they are making the change and ask if it could help them to win back customers. For more than a year, You & Yours has been investigating the Cavity Wall Insulation industry and the problems people have had in putting things right when they go wrong. We've received complaints that insulation has been fitted in many homes that were unsuitable for it and as a result people have suffered serious damp. Last week one of the big players in the industry, the Mark Group, went into administration with the loss of more than 900 jobs. Where does that leave customers who are still facing problems? We report on a row in Sheffield about plans to fell around 4000 of the city's road-side trees and replace them with smaller trees which provide less canopy. Campaigners describe it as vandalism and complain that they haven't been properly consulted. Civic leaders insist that diseased and damaged older trees need to be replaced and their plan will leave the city with more trees than before. Changes to the Tesco price-matching scheme. An update on our investigation into a company which claims to operate private detectives. If e-cigarettes can help people quit smoking, should children be allowed to use them? A BBC investigation into the Mark Group's work installing cavity wall insulation. Savvy Marketing’s Catherine Shuttleworth reflects on Tesco’s price promise relaunch.